Hello everyone, and welcome to another Singaporean watch review! This Sunday, I’m reviewing yet another homegrown watch effort – the Vilhelm Talos. The Talos is billed by Vilhelm as a “A Luxurious yet Affordable Multi-material 500m Diver made of Bronze, Forged Carbon & Steel; powered by a Swiss Sellita SW200 movement”. (Vilhelm, you need to come up with a smoother byline.) The Vilhelm Talos was live on Kickstarter here, and Vilhelm have blown way past their funding goal! The Vilhelm Talos, seen here with a blue dial. The bronze looks good, doesn’t it? Kickstarter watch brands tend to get a bad rep – all style and no substance, with meaningless phrases like “Disrupting the luxury watch industry” commonly thrown around. However, Vilhelm seems to have managed to shed that reputation. Why so? Let’s find out! Nop (left), pictured beside Octavio Garcia of Gorilla Watches. (who was also Audemars Piguet’s creative director). I guess Nop couldn’t resist snagging a photo with one of his idols! I really like Vilhelm as a brand. My main gripe with Kickstarter watch brands in general is the lack of design ethos. To me, having a distinctive design ethos is what separates the wheat from the chaff. This is probably most evident in luxury brands such as Rolex – the design of the Submariner, Daytona, Datejust, etc. are so distinctive that you would never mistake a Rolex watch for anything other than a Rollie. This applies to microbrands as well – Zelos, Gruppo Gamma and Maison Celadon are probably the most evident examples. That probably explains why they have such a strong loyal following! With the Talos, Nop didn’t want to create yet another diving homage to the Rolex Submariner. He wanted to create something distinctive, combining materials you’ll typically find in the high-end watches of his collection (RM, AP, etc). The end result is the Talos (named after the bronze automaton of Greek mythology) – a dive watch that exemplifies Vilhelm’s brand ethos of “unique, contemporary and masculine” styling, constructed with “the best materials available and being used in the luxury watch market today”, and offered at a relatively affordable pricing. Nop was kind enough to loan me an early prototype of the Vilhelm Talos for review. Let’s check out the build quality of the watch! In case you haven’t already noticed, the Vilhelm logo depicts a Spartan helmet. I’m glad to report that this theme of strength and robustness extends to the build quality as well! Sapphire crystal protecting the dial, Swiss Sellita SW200 movement beating underneath. Firstly, sapphire crystal is used in the Talos. Sapphire crystal makes the dial virtually scratch-proof, and is thus a pre-requisite (in my books at least) for a well-made watch. AR coating is applied on the Talos as well to prevent unwanted reflection, allowing you to view the dial in its full beauty. Inside, the Sellita SW200-1 movement powers the Talos. The inclusion of a Swiss movement is great in my opinion, as many watches around the $1000 mark still utilizes cheap Japanese movements like the Seiko NH35A or Miyota 8 series (SevenFriday for instance). For those unfamiliar with watch movements, the Sellita SW200 is basically a ETA 2824 clone, with some small improvements. It’s nothing to be scorned at – several well-established luxury brands such as Oris, Raymond Weil, and Mont Blanc use Sellita SW200 base movements in their watches. These watches are often two to three times the price of the Talos, so that speaks to the quality of the Sellita movement in itself! For more information regarding the Sellita SW200 VS ETA 2824 debate, Watch Flipr has an article on it here. Some basic specs: the Sellita SW200 beats at 4Hz per hour (contributing to the smooth sweep of the second hand), has 38 hours power reserve, 26 Jewels, and is hacking with quick date function. Yes, the Talos comes with a date function, thereby addressing one of the main criticisms of Vilhem’s maiden model, the Elemental. The Talos’ calling card – a bronze and forged carbon case. The USP (unique selling point) of the Talos is its combination of bronze and forged carbon materials. Bronze watches are all the craze nowadays, ever since Tudor introduced the highly popular Black Bay Bronze. Since then, bronze has also trickled down into the microbrand world, with several prominent brands (Zelos, Lum-tec, Halios, etc) all offering bronze divers. Vilhelm went a step further than all of them by merging bronze with the ultra-tough and lightweight forged carbon! According to Vilhelm, they are the first watch company to fuse these two materials together in a watch case. They describe it as “A marriage of the past and the future”. I catch a glimpse of Nop’s fascination with ultra high-end watches here – the bronze influence from Tudor and Panerai, and forged carbon inspiration from Bell & Ross and of course, Richard Mille. That’s Vilhelm’s mission: to offer materials most commonly seen at higher price points in an affordable watch. The various components of the case. What’s even more impressive is the 500M WR rating on the Talos. Vilhelm said that “[t]he main challenge was how to ensure that the structural integrity of the case would be able to withstand high-water pressure, which is not easy when you have 2 different types of materials and a very complex case-construction.” To solve this riddle, they had to experiment with multiple case factories before finding one that was able to machine the case to Nop’s desired WR rating. Honestly, in practicality 500M WR is probably overkill. I highly doubt anyone would wear the Talos and actually go for a legit dive. Vilhelm could have settled for 300M WR, 200M WR even – I doubt people would have complained, and I’m sure that the Talos would still be snapped up all the same. However, Nop really wanted to go for that 500M WR rating – to him, it’s a testament to the robustness of the watch. I really respect Vilhelm for sticking to what they felt the Talos (and by extension their brand) stood for, and not compromise for less. Lume shot. Crazy lume – by far the most among all the watches I’ve reviewed so far! Vilhelm’s approach with lume on the Talos is fairly simple: “More is more“. Almost everything that can be lumed, they lumed with BGW9. The hands, indices, and minute ring are all lumed, the Vilhelm logo is lumed (blocked by the hands in the above photo). Even the crown is lumed! Amazing stuff. Lume heads out there, I guarantee that you will be pleased with the Talos. The Talos is one of the most ergonomic watches I’ve worn to date. The Talos comes fitted with a rubber strap. Now, most have the misconception that a rubber strap equates to cheap, low quality watches. Make no mistake – the rubber strap here is no ordinary rubber strap. The strap is smooth, lightweight, and sits on the wrist extremely well. When worn on the wrist, the curve of the lugs combined with the fantastic rubber strap results in a watch that feels great on the wrist. When worn, the Talos doesn’t slide around – it wraps around your wrist like a glove. Currently, the Talos also comes on a variety of brightly colored rubber straps, which pairs strikingly with the bronze case of the watch. Overall, I’m extremely pleased with the build quality of the Talos. True to its namesake, this is one tough watch. “Majestic” was the first adjective that popped into my mind when I saw the Talos. One of Vilhelm’s key design ethos is the cushion case. It’s a design element that’s in the Elemental, and will be part of future Vilhelm watches as well. The bronze cushion case simply looks amazing. The Talos that I have now is an early prototype model, and therefore I assume that it has already been passed around to various reviewers before me. As a result, the patina on the case shows beautifully, giving the case an aged and rugged look. Flanked on all four corners by pieces of forged carbon, the watch is truly a sight to behold. In some ways, the case actually reminds me of the actual Spartan Corinthian helmet! In ancient times, Spartan helmets were forged from a single piece of bronze, much like the case of the Talos. The bezel on the Talos is actually indented and finished differently, therefore giving the bezel depth and contrast. Magnifique. The dial is a stunner too. The crown is bronze too, signed and lumed. Unlike most other microbrand bronze divers, the crown of the Talos is bronze, not stainless steel. As aforementioned, the signed logo on the crown is lumed as well. The crown is a screw-down one too, a must to attain that high 500M WR rating. Due to the deep grooves on the crown, rotating the crown out for a wind was a breeze. In addition, I really like the lugs on the Talos. I don’t think it’s clear in the photo above, but the lugs are finished differently. The main lug is brushed, while the beveled edges are polished, giving it a striking visual contrast. Seeing the attention paid to such minute detail makes me incredibly happy – it’s a sign that great thought has been poured into every corner of this watch. The buckle is a matching bronze too! Yup, the buckle of the strap is made of bronze too. That means that the buckle will develop a patina alongside the watch! Again, I’m glad that thought has been paid to such details. The caseback depict its namesake, Talos. Likewise, I feel that the caseback is rather nicely done! Again, there’s contrast in both depth and texture. The bottom layer is sandblasted to mimic the visuals of asphalt, while the raised ring above is polished to a mirror sheen. I’m a sucker for caseback artworks too. My first ever review was of the Boldr Odyssey, which featured a caseback artwork of a boat sailing under the stars. Here, the artwork of Talos (the giant bronze defender of Europa) is detailed. The muscles of the mythological automaton are defined, as are the lines of the pedestal he rests upon. Most dive watches stamp generic images of helmets/sharks/boats on the caseback, so it’s nice to see Vilhelm doing something different. However, I wished they made the caseback in titanium instead of stainless steel. Vilhelm’s first watch, the Elemental, featured a titanium caseback – if Vilhelm managed to combine bronze, forged carbon and titanium here, they would have knocked it out of the park. I really like the design of the Talos. I agree with Alexander – there’s something inherently masculine about the watch. When the Talos is on your wrist, you begin to feel a little taller; your shoulders, a little straighter. I’m usually not a fan of divers (they seem to all look the same after a while), but with the Talos I’ll make an exception as the design language is just simply so distinctive. The appeal of this watch is undeniable. Helson is a respectable player in the bronze divers category, and thus I’ve chosen their Stingray to be Talos’ competition in this shootout. 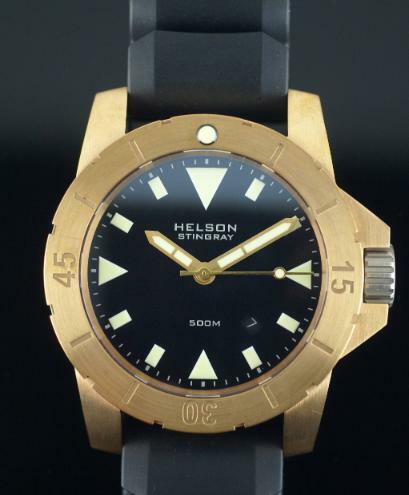 The Helson Stingray Bronze is priced at $1299 USD (S$1710), available on Helson’s web-store. Spec-wise, I’ve to say that even though the Vilhelm Talos is significantly cheaper (almost $300 USD less! ), it edges out the Helson Stingray. Both have a bronze case, Swiss automatic movements (the Helson uses an ETA 2824), sapphire crystal, and rubber straps. Nevertheless, the Talos has a higher WR rating (compared to the Stingray’s 300M), a forged carbon mid-case, more lume, AND a bronze crown. In the Stingray’s defence, it does have a titanium caseback. Overall though, I’ll have to say that the Vilhelm Talos has slightly better specs. Design-wise, the Talos is a clear winner for me. The Stingray isn’t a badly designed watch – it’s just not special. It lacks the details that the Vilhelm Talos has. There’s no depth to the Stingray’s dial – even the indices are painted, not applied. The hands are rather generic as well (they actually look pretty similar to my Undone Aqua). There’s no texture too – the dial is simply matte black, while the date window (in my opinion) looks out of place. Certainly, the Talos does a much better job of integrating the date window. Therefore, the depth and contrast in the design of the Talos trumps the conservative styling cues of the Helson Stingray for me. Keeping in mind that the Talos is almost S$400 cheaper than the Stingray, I have to pronounce the Vilhelm watch as the winner in this shootout. The Helson Stingray, while a respectable dive watch in its own right, honestly doesn’t look that much different from the rest of its competition. The Vilhelm Talos on the other hand looks distinctively Vilhelm – it definitely does not remind me of any other dive watch that I’ve come across! Conclusion: So the Vilhelm Talos “shiok” or not? Oh hell yes. Vilhelm has certainly upped the ante here – the Talos looks like no other dive watch on the market now. When I strapped the watch on for the first time, synapses started firing in my brain. I just couldn’t believe how incredible it felt on the wrist. The Talos is also my first bronze watch – it was my first time seeing patina on a watch case, and the aged character that it portrays simply captures my heart. I think I now have a newfound love for bronze watches! The full colorway of the Talos – Rose Gold, Blue, Black, as well as a Skull version! At a mere $989 USD/ ~$1348 SGD (after promo code below), I believe that its value is hard to beat. For that money, you get a fusion of bronze and forged carbon, a Swiss automatic movement, and incredibly detailed design visible throughout the watch. The strap is quality as well, supple to the touch and lightweight – it’s certainly not those kinds that you find on Casio watches! If you liked what you read, and would like to support a local watch endeavor, you can order one on their web-page here! I’m also glad to announce that Vilhelm has graciously extended a 10% discount code (WAHSOSHIOK) for my readers – simply input the code upon checkout to enjoy the discount. If you missed getting the Talos during Vilhelm’s Kickstarter campaign, this would be a great chance to get one for yourself for cheap. View Vilhelm’s full range of offerings here. 43mm case, 13.5mm thickness . 50mm lug to lug. BGW9 lume hands, ring , crown. Bronze cusn8 bezel and lugs. Your mode of explaіning everything in this piece of writing is really nice, all be capable of easily understand it, Thanks a lot.